With fans anxiously awaiting word on whether Sega plans to bring the 224 song monster that is Project Diva Future Tone to the West, why should they bother with the measly 30 tracks in Hatsune Miku Project Diva X? Because this one’s got more actual game in it. The rhythm games we’ve seen featuring Japan’s virtual idol thus far have been little more than lists of songs that players must complete to unlock more songs, costumes and stages, and there’s nothing wrong with that. I quite enjoyed working through the song lists for Project Diva F and F 2nd on the PlayStation 3/Vita, and Project Mirai’s use of touch controls on the 3DS helped change up the formula significantly. What Project Diva X, available August 30 for the PlayStation 4 and Vita, brings to the table is narrative and structure. The power has been drained from the world of Hatsune Miku and friends, and the player must help them regain their singing talent by completing a series of five themed worlds, called clouds—Classic, Cool, Cute, Elegant and Quirky. Players must tackle these clouds one at a time, beating each of the five songs presented and completing a final medley to finish things off. Each cloud has its own light storyline, complete with visual novel style cutscenes. For example, in the Cool Cloud Miku and friends decide to create their own rock band. As the player progresses through the five core songs, they’ll see vignettes of the characters discussing their performances, the instruments they are playing and so on. Once all five songs are completed, it’s medley time. And become rock legends they do, or at least they try. Check out my initial performance of the Cool medley below. I don’t fail, but I could have done much better. 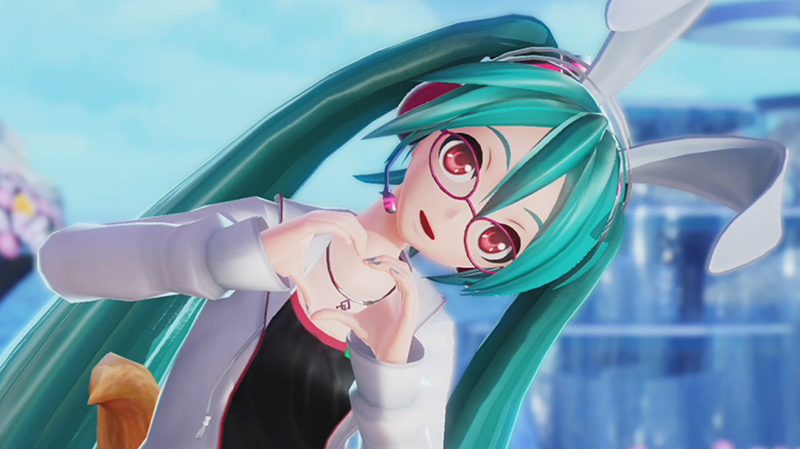 At around 2:50 in that video, you’ll see another compelling reason to play Project Diva X. Rather than have the player unlock new outfits for the characters by spending accumulated Diva points, here each song features a Chance Time section that, if completed successfully, randomly unlocks a new costume via a transformation sequence. It’s like they’ve laced each performance with candy. The costumes are more than just decorations. Each features a special modifier that helps the player gain the most Voltage (score) while playing. Costumes and accessories are linked to specific cloud types, so putting together the perfect outfit can result in a huge score boost. The basic extra bits players enjoyed in previous Hatsune Miku titles are still around in some form. Characters will randomly make vague gift requests, and choosing the correct one will increase relationship levels, which in turn affect song performance. Miku is a big macaroon fan. From time to time players are asked to create their own live show, choosing songs and characters to sing them. It’s in these create-a-concert moments that the limited song selection is felt most acutely. There are 26 basic tracks in the game, two of which return from previous games. The other four tracks are original medleys of other tunes, which are lovely but leave me wishing the full tracks were included as well. It’s still a good mix (my current favorite is LamazeP’s “Love Song”), but since the tracks are split up into five different clouds there’s a good chance you’ll come across one where you’re not fond of a majority of the selections. If you muscle through and complete the entire game, unlocking each of the five clouds, you get to keep doing it over and over again to unlock all of the modules for each of the game’s six characters. One complaint I saw on message boards following the Japanese release of the Vita version earlier this year was the end game gets repetitive, but that should only apply to the most relentless costume hunters. For those of you who prefer the original Hatsune Miku game style, there’s good news and bad news. The good news is you can go to Free Play mode and play through songs as you wish, with difficulties up to Extreme (the quest mode limits players to Normal difficulty initially). The bad news is you have to unlock the songs in the main story to play them in Free Play, so you’re going to have to go through it all at least once. Hatsune Miku Project Diva X is a new sort of Hatsune Miku game, one that goes quite a bit deeper than its predecessors. It might not have anywhere near the 220+ songs of Japan’s latest game, but its got much more charm and heart to it. Plus, if Sega does wind up bringing Future Tone to the West, we’ll need something to do while we wait. I’m satisfied with this.